I absolutely love handmade greeting cards-- both the act of card making and also receiving lovely handmade cards. I really began making cards when I was making my own wedding invitations. I had so much fun doing it that I never really stopped. While these two cards will give you some great Valentine ideas, many of the tips in this tutorial will work if you're just learning to make your own holiday cards. 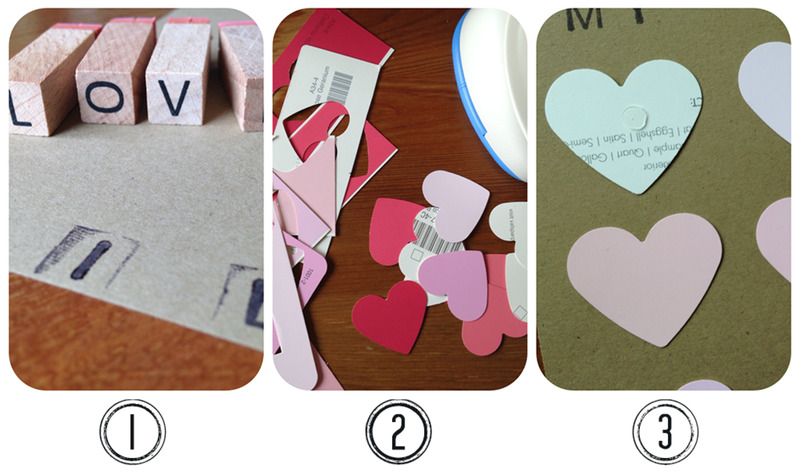 The two simple Valentine cards featured in this tutorial are simple to make and inexpensive. I made both cards from one piece of cardstock cut in half and 7 paint chip cards from my local Lowe's. The alphabet stamps used in this tutorial are a full set of letters as well as a period and comma (. ,) that were purchased from the dollar section of Michael's for $2.00 (January 2014). I've also seen similar sets (one set has all capital letters and another is lowercase) in the Target dollar section for $3.00 (as of January 2014). Card stock is the perfect paper weight for this project. Cutting an 8.5" x 11" piece of card stock in half (width-wise) will yield 2 cards (postcard-style greeting cards). 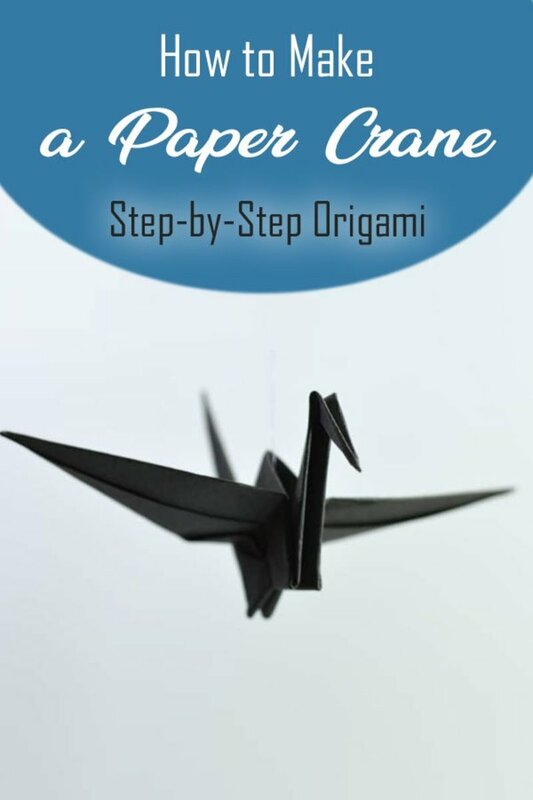 Folding the paper in half will yield a traditional greeting card that opens/closes. 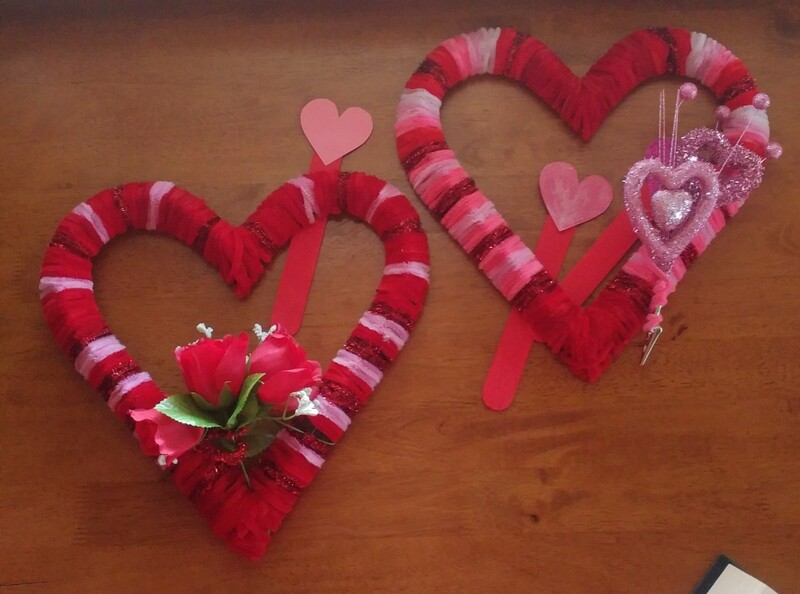 To line up your hearts in rows and columns without math or measuring, arrange your display before gluing. Glue the first column, using the left edge of the card as a guide to "eyeball" the distance. Moving down, each point of the heart should line up in the middle with the arches of the next heart. Repeat this process to the third column of hearts, using the right edge of the card as a guide this time. 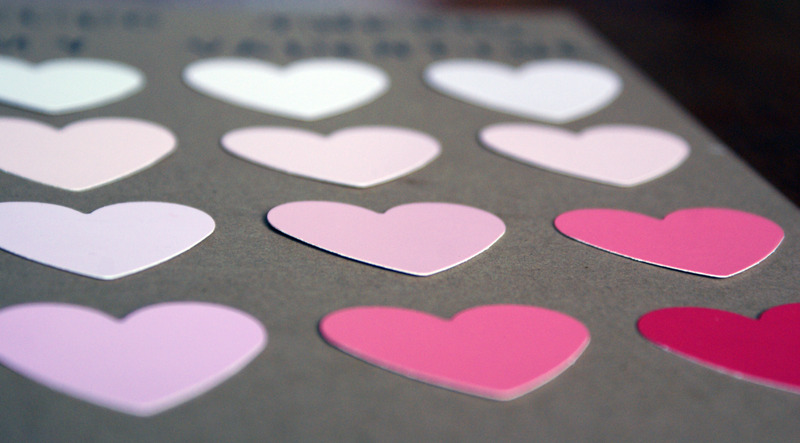 Glue the middle column of hearts last, using the two outer columns as guides for distancing and positioning. 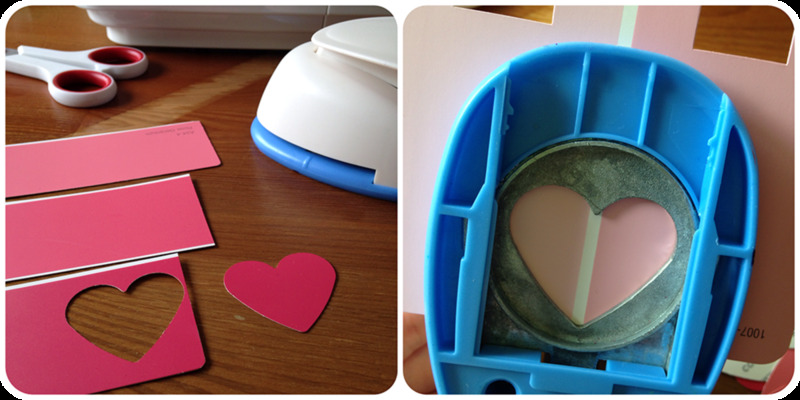 Glue dots aren't super flat and do give the hearts a tiny pop-out effect. For a more 3D effect, use 3D adhesive foam squares. 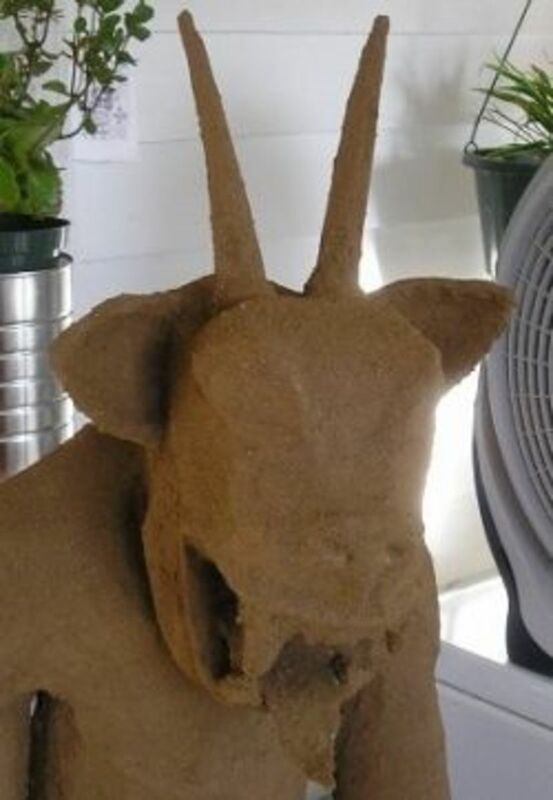 You can find them in the scrapbooking supply aisle of most craft stores. 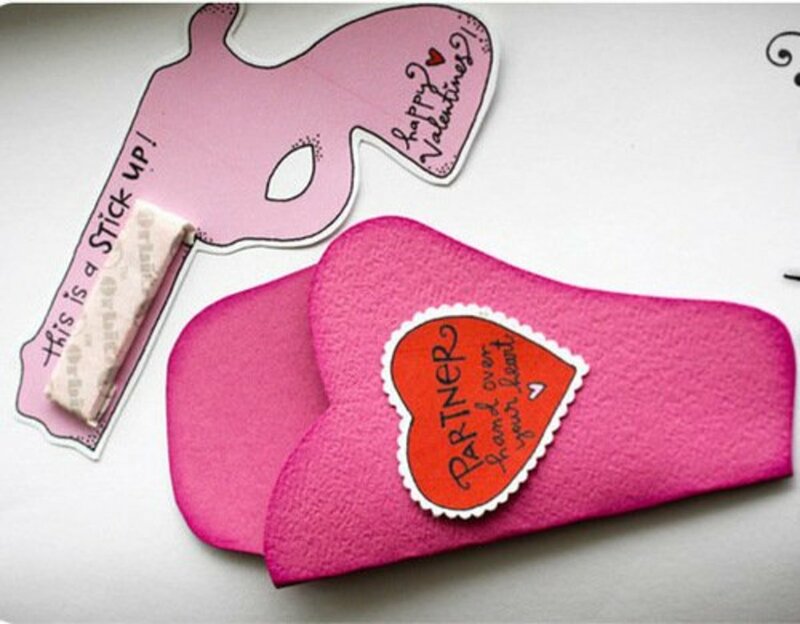 Stamp message onto card and punch out 24 paint chip hearts. 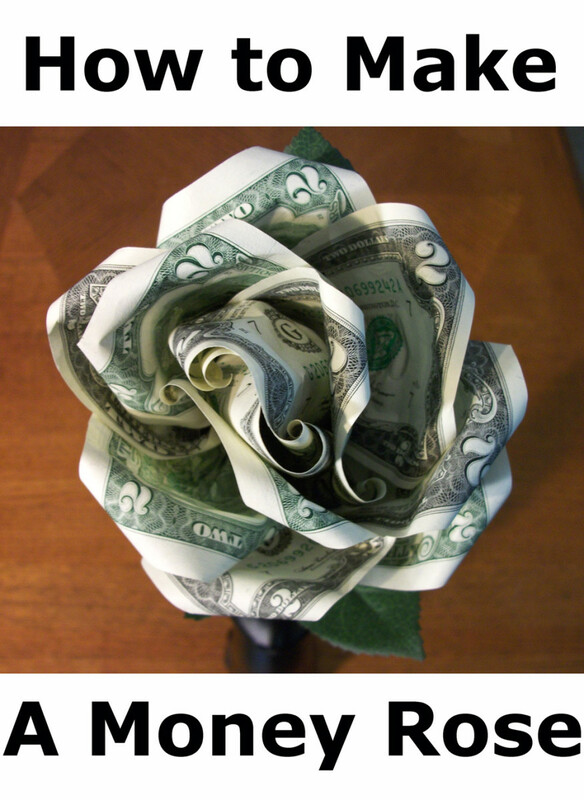 Arrange design with three hearts per stack. 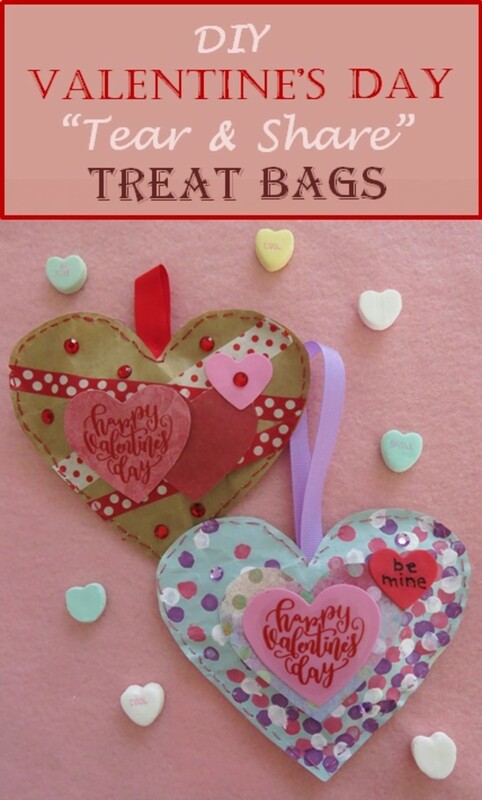 Sew heart stacks onto card stock with sewing machine. 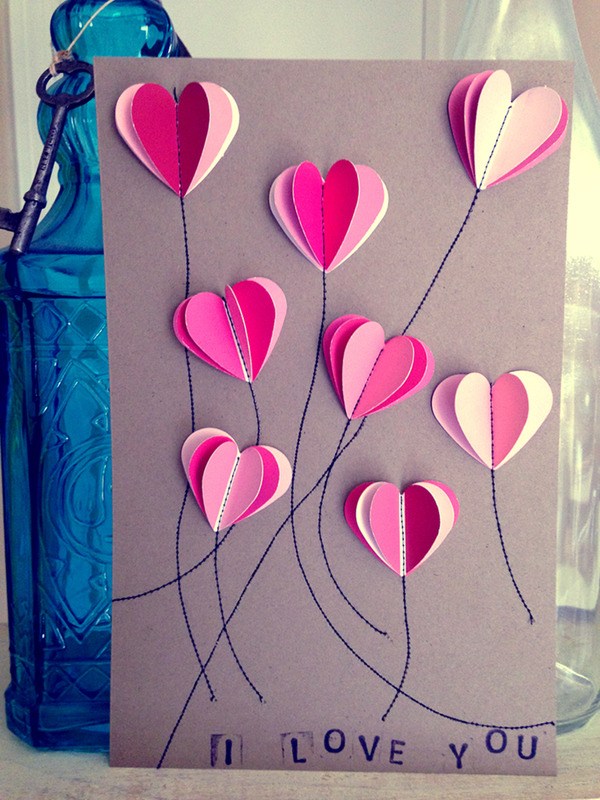 Stitching should begin on heart balloon and can end near the bottom of the card or off of the card. Sew the highest balloons or balloons furthest in the background first. 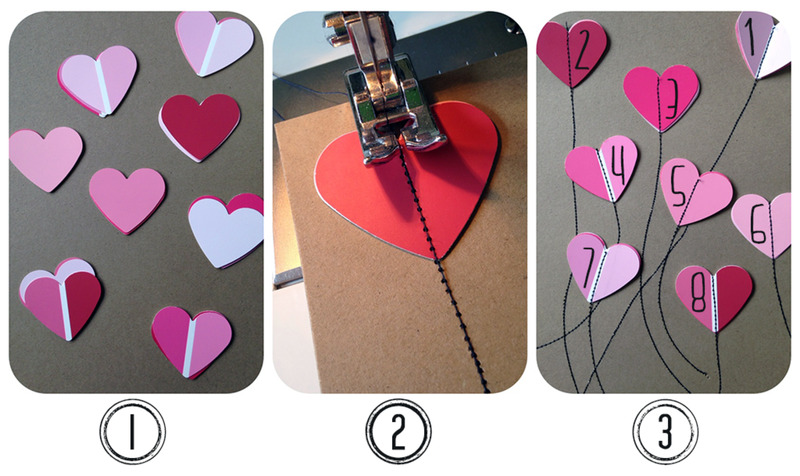 See photo for step 3, diagramming the order in which I sewed my hearts (numbered 1-8). Balloons closest to the bottom or foreground should be sewn last. Carefully bend up the top two hearts of each balloon, folding them upward and together at the seams. The very bottom heart will remain flat against the card stock for the full 3D effect. The finished card will be a little more fragile once all of the sewing is done. (The stitches create perforations, weakening the card just a bit.) You can always mount this card onto a second piece of card stock if desired. The balloon string stitches are also visible on the back of the card. Keep that in mind if you are designing this as a card that opens/closes as the stitches will be on the inside of the card. I think it looks neat, but you can always cover it with another piece of card stock or line the entire card with a lightweight paper, similar to some store-bought greeting cards. You can arrange your balloons each with three solid hearts or a variety of colors and shades. I did the latter, also taking advantage of two tone hearts. In the above photo of step 3, hearts stacks numbered 1, 4, 7, and 8 have two tone hearts on the very top of the stack. Punch two-tone hearts out by punching directly on the white separator line of a paint chip sample. Each heart half will be two different colors. This also gives you a nice solid white line as a guide for sewing your hearts down the middle and on to the card. I finished both of these cards in one sitting and just under thirty minutes. I'm really happy with how they came out. This craft is also perfect for finishing up leftover scraps of pretty scrapbooking papers. 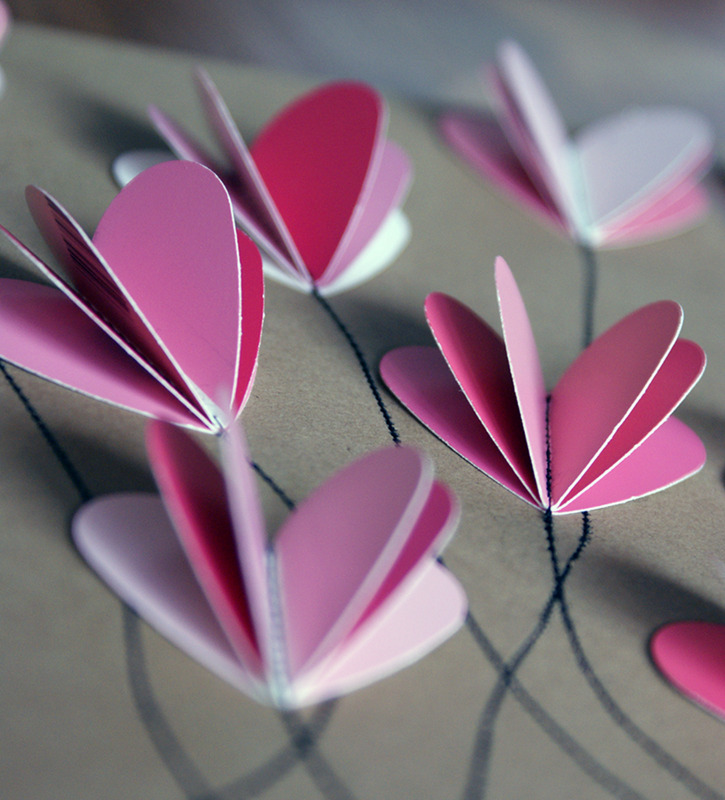 Depending on the thickness of the paper, you can usually add another heart (for a total of 4 per stack). I like to use many different papers to make cards very colorful and unique. That's also why I love working on a plain brown recycled card stock-- it really allows your colors and designs to pop! I hope these ideas inspire you to make your own cards. 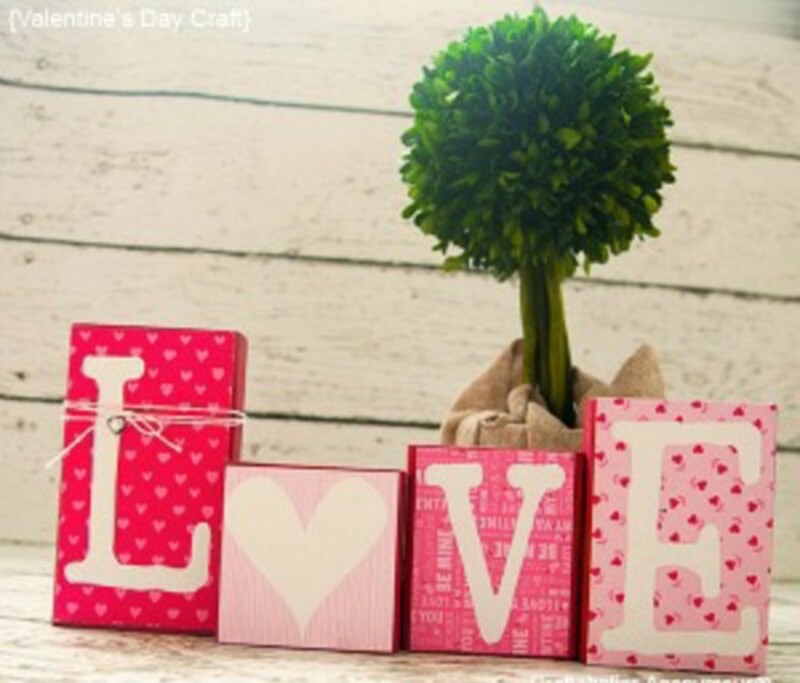 You can also check out the greeting card sections of your local stores and Pinterest boards to get lots of great DIY Valentine card ideas. Coming home to make your own inspired ideas is twice as fun and usually half the price (or less)! Happy Valentine's Day! Wow.. ths is the real love. making gifts for love... great. Hello Heather, I truly love the Valentine Cards you made! 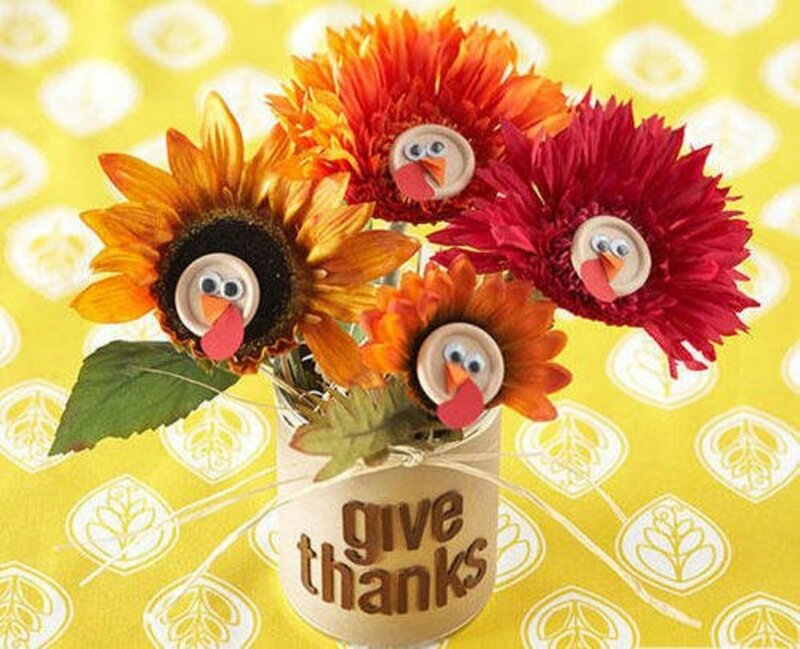 They are super cute, and don't look that difficult to make, which is a great combination when making cards. Thanks for sharing! This a great hub! Those handmade Valentine cards are lovely. Thanks the wonderful tips. Fun and very thoughtful! It amazes me that creative, quality cards like these aren't found in stores such as Target, Walmart, or grocery stores. Great idea! I had to come take a look as I had no idea what paint chips were! I love the dimensional heart balloons! Now if I could just get up the nerve to take a bunch of paint swatches from the store I'd be set. For some reason I always feel bad taking them. My daughter, on the other hand, has a collection of them and gets more every time we go to one of those big hardware stores. These are so clever Heather. What an absolutely great idea Heather! Who would've thought of using those paint chips in such an adorable way! Your instructions are easy to follow and I have a feeling there'll be a lot of handmade Valentines with paint chips this year. Your photography and graphics are great! Wow... Great idea. It looks so beautiful. Thanks for sharing. Voted up and beautiful. 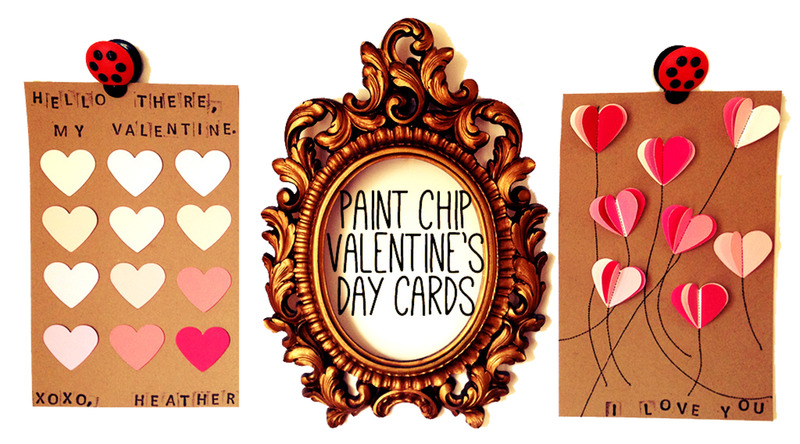 Both of your paint chip Valentine's Day cards are so adorable! I especially like what you did with the balloons. They're so whimsical. very cool. passing this on. Great ideas, Heather! 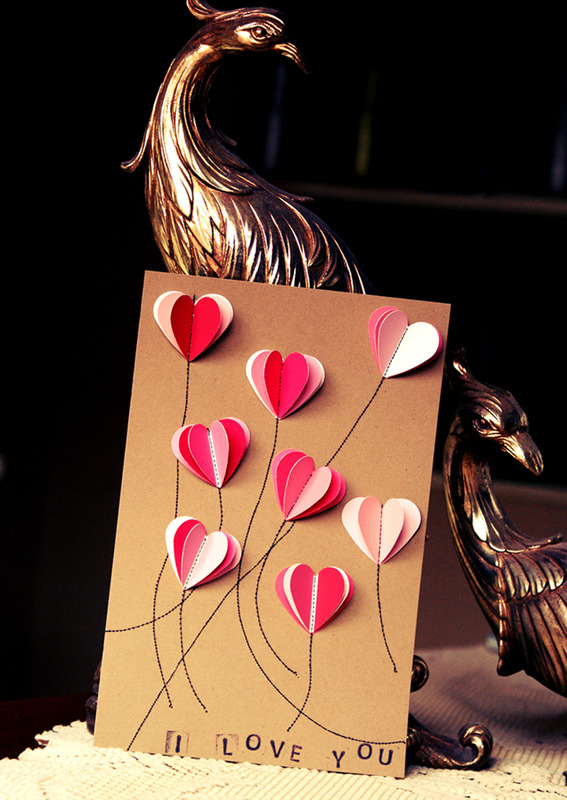 I particularly like the 3-d heart balloons card - so creative!! 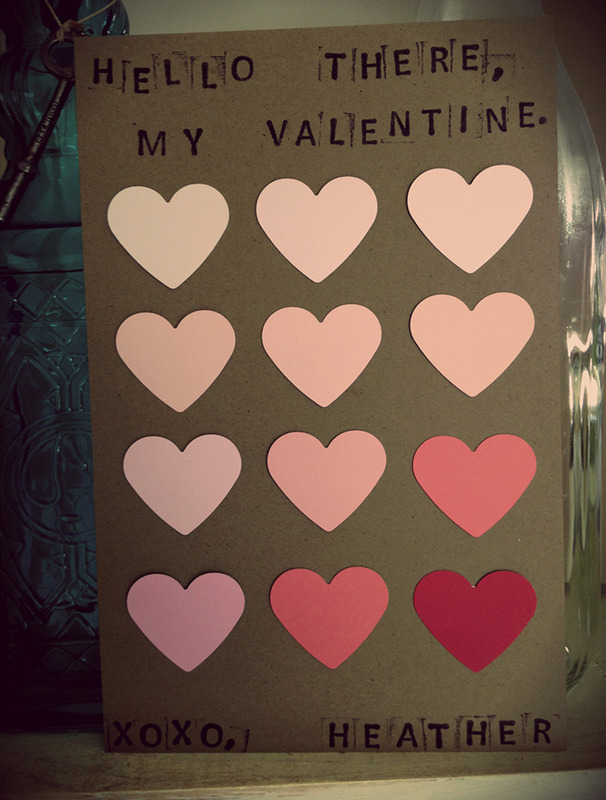 I hope your "valentine" gives you a card that's just as lovely and beautiful :) Thanks for sharing!! This is such a creative, beautiful idea. You know, I've always loved those Sherwin-Williams commercials where they use the paint chips to make full landscapes. This kind of reminds me of that idea! I love it!